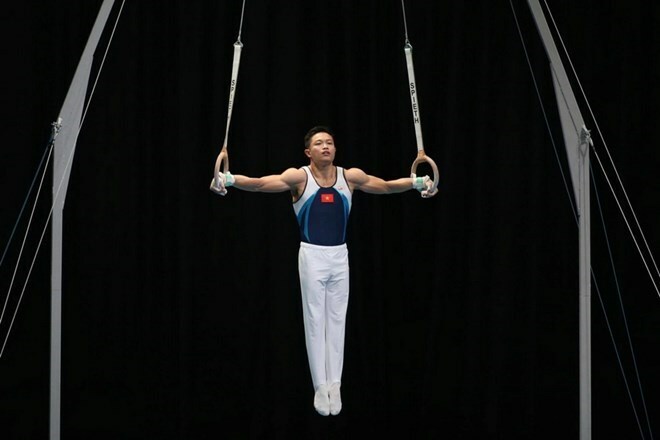 Kuala Lumpur (VNA) – Gymnast Dang Nam has won the 9th gold medal for Vietnam at the ongoing SEA Games 29, after scoring 14,300 point in the rings event on August 22. The same day, Nam’s team mate Phuoc Hung secured a silver medal in the pommel horse event. Vietnamese gymnastics athletes to SEA Games 29 aim for four gold medals, and they are yet to compete in the two events of their strengths – high bar and parallel bar. The same day, four cyclists – Huynh Thanh Tung, Mai Nguyen Hung, Nguyen Truong Tai and Trinh Duc Tam – obtained a bronze medal for their performance in the men's team 50km time trial event. Vietnam has so far added 1 gold, 3 silver and 3 bronze medals to its tally on August 22. The country sent more than 470 athletes to the SEA Games 29 in Malaysia from August 19-30. They are scheduled to complete in 32 out of 38 sports with more than 6,000 rivals from 10 other countries in the region.